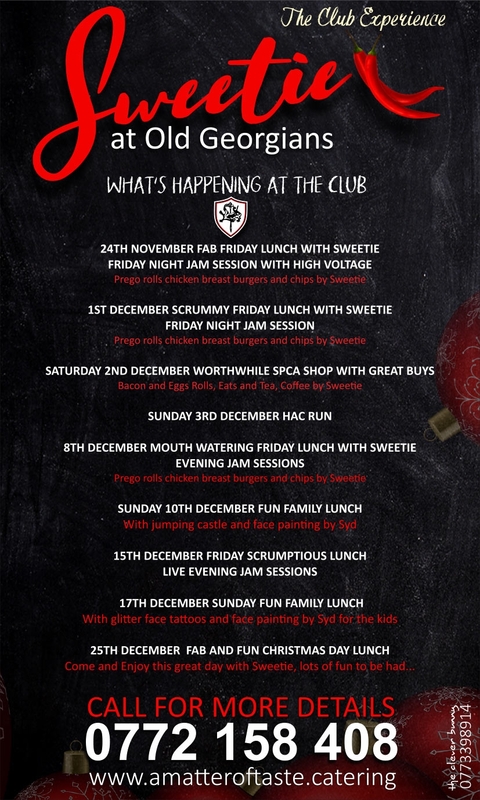 1st December Scrummy Friday Lunch with Sweetie Friday Night Jam Session. Prego rolls chicen breast burgers and chips by Sweetie. 2nd Decenber Worthwhile SPCA Shop with great buys. Bacon and egg rolls, eats and tea, coffee by Sweetie. 8th Decenber Mouth Watering Friday Lunch with Sweetie Evening Jam Sessions. Sunday 10th December Fun Family Lunch. With jumping castle and face painting by Syd. 15th December Friday Scrumptious Lunch Live Evening jam Sessions. With glitter face tattoos and face painting by Syd for the kids. Come and enjoy this great with Sweetie, lots of fun to be had.